- Responding to a distress call, Scotty orders the Enterprise to the distressed ship's location at warp 5. 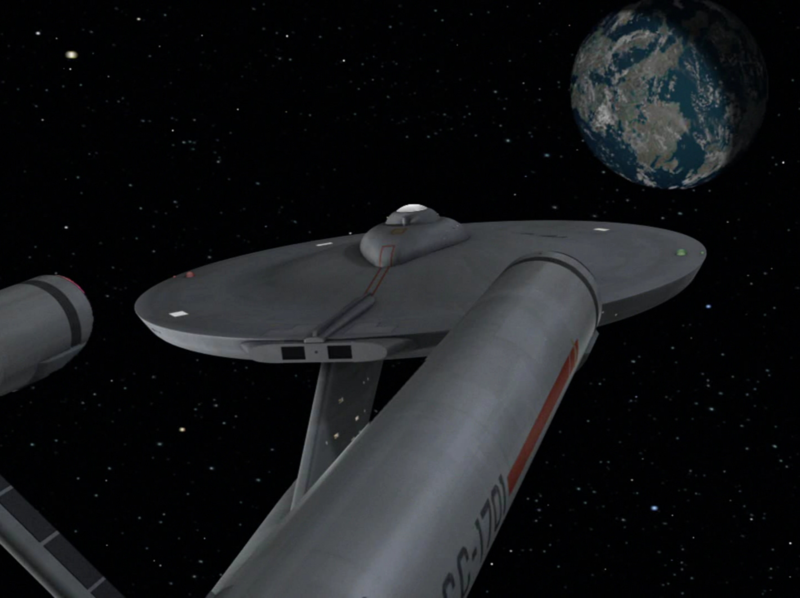 But the Enterprise's maximum speed is at least warp 7 or 8 from other episodes we've seen! I guess they're not in that much distress after all... Then to make matters worse, when he returned to the planet, he did so at warp 6, and made a big point about it! Yes, because when the captain's in trouble, it matters far more than the lives of potentially an entire freighter! 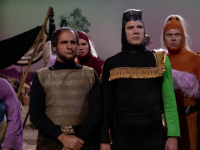 - In the teaser when McCoy is briefing the senior officers on the aliens of the week, the footage shown of them battling is actually recycled material from later on in the episode when the warriors are hunting down the landing party. - This episode establishes that the maximum speed of a Federation freighter is warp 2. - The security offer whipping out his phaser the moment he saw a Klingon and then getting instantly killed. - Kirk currying favor with the new tribal leader by exposing fear in the Klingon and proposing that he be allowed to duel the Klingon. - McCoy and Eleen slapping each other. - Kirk and Spock constructing and wielding bows and arrows. An episode which on the surface seems nearly identical to Errand of Mercy. Once again we have a proxy battle between the Federation and the Klingon Empire and once again the aliens of the week being manipulated by this proxy fight are a primitive race which oddly appear identical to humans. The trouble is Errand of Mercy was a good story and this episode sucked. In Errand of Mercy we're treated to the delightful character of Kor whose well characterized personality really drives home the philosophy of the Klingon Empire and how it differs from that of the Federation. But in this episode, the Klingon antagonist lacks intrigue or personality of any kind. He falls completely flat. This contrast is even reflected by the events in orbit of both episodes. In Errand of Mercy there's an exciting space battle in orbit. In this episode there is no action in space at all. Instead the Enterprise follows up on fake distress signals and chases away a timid, fearful Klingon ship, lacking in any kind of dramatic appeal whatsoever much like its Klingon counterpart on the surface. On top of that the diplomacy in this episode is terrible in a couple of places. First and foremost, the entire premise of this episode is a blatant violation of the Prime Directive, again much like Errand of Mercy. 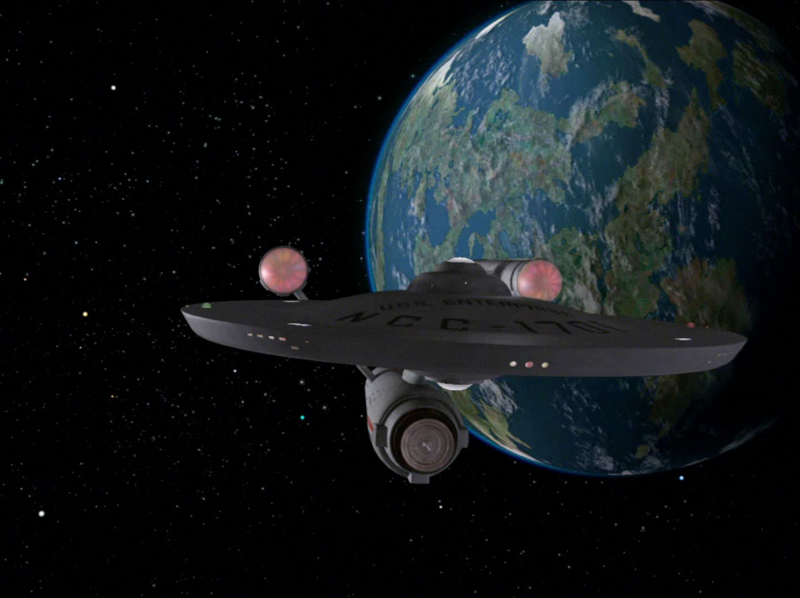 Second, even if we assume that the Federation had made an exception to the Prime Directive due to the importance of securing the resources on this planet, that by no means gave Kirk the authorization to interfere with local law by saving Eleen, thereby endangering the mining rights negotiations as well as the lives of the landing party. But it wasn't just Kirk who was off his game today because the bridge crew of the Enterprise started to look mighty stupid too by the end of the story. 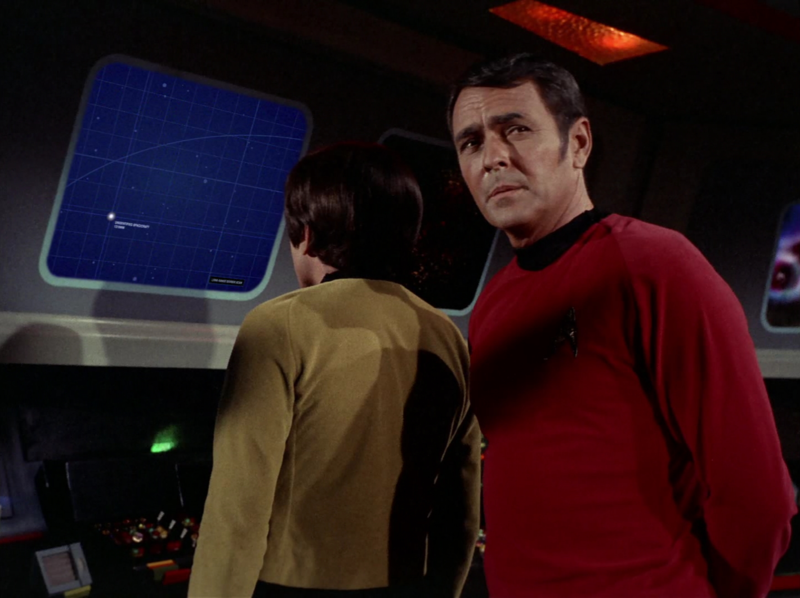 I'm glad that the overwhelming obviousness of the distress call being fake eventually occurred to Scotty, but the time for that was well before he turned the ship around. The most annoying scene on the bridge was when Uhura questioned Scotty's rather solid reasoning about the distress call being fake with little more than "but what if it's real?" That challenge alone convinces Scotty to keep plugging away at the useless search for a while longer, further endangering the landing party unnecessarily. Probably the only charming aspect of the story was McCoy's high degree of competence, which was a nice relief from an episode filled with incompetence by nearly every other character. For reasons not terribly well explained McCoy seems to be an expert on this planet's culture and while on the surface he takes charge of the medical situation effectively and in ways allowing for a bit of decent humor as well which too was a nice relief from the overabundance of fistfights and tribal ritualistic nonsense the episode seemed to focus on to excess. Overall though this episode is quite a disappointment. I liked this episode a little. 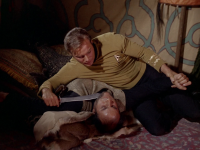 It is one of the rare episodes where Kirk spends a great deal of time regetting the loss of his fellow redshirted crewmember, the one who dies a minute after beaming down. He even chews out McCoy with his misplaced anger. Also, McCoy's semi-romance with the pregnant woman is interesting. Eventually, the show falters as it shifts into cliche action sequences out in the rocks. This is the only time I know where a communicator is used to create an avalanche. One more thing, there's something distrubing when you hear McCoy saying Ochie Woochie Koochi Koo; it's sounds dubbed. Pretty poor episode, but just one thing: isn't there a line about how McCoy spent some time on the planet getting to know the locals, which is how he has some in-depth knowledge? "On top of that the diplomacy in this episode is terrible in a couple of places. First and foremost, the entire premise of this episode is a blatant violation of the Prime Directive, again much like Errand of Mercy. Second, even if we assume that the Federation had made an exception to the Prime Directive due to the importance of securing the resources on this planet"
Eventually I assumed that you would figure out that the Prime Directive does not apply to worlds where the Klingons will conquer and destroy unless you intervene. The point of the Prime Directive is to allow worlds to develop naturally. If you have advance knowledge that a race (i.e. the Klingons) are going to conquer, use, and destroy a planet, then yes, you can intervene because the Klingons are going to intervene regardless of whether you do. Come on man. Stop being so uselessly hard on TOS. We all clearly realize that you dont like TOS in favor of the precious continuity of the much lesser DS9 and the like. In addition to the above, come on, give some credit to the ending. 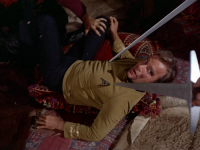 The antagonist of the entire episode finally comes to the realization that the Klingon that he has been supporting is in fact a fraud, and decides to sacrifice himself for the good of his people. That is the kind of antagonist I can get behind and the kind of one that makes a great episode. I wasn't going to comment on this episode but feel the need to interject something re: The Prime Directive. 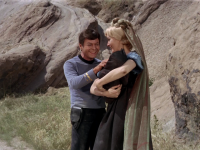 That regulation was blown out of the water at the episode's beginning with McCoy having already visiting the planet and learning about its people. I see no problem with the PD in this episode at all. I do have a problem with Kirk's rationale that they violated no customs and so on! Is he high?! ?Ridiculous for him to even go after Bones! 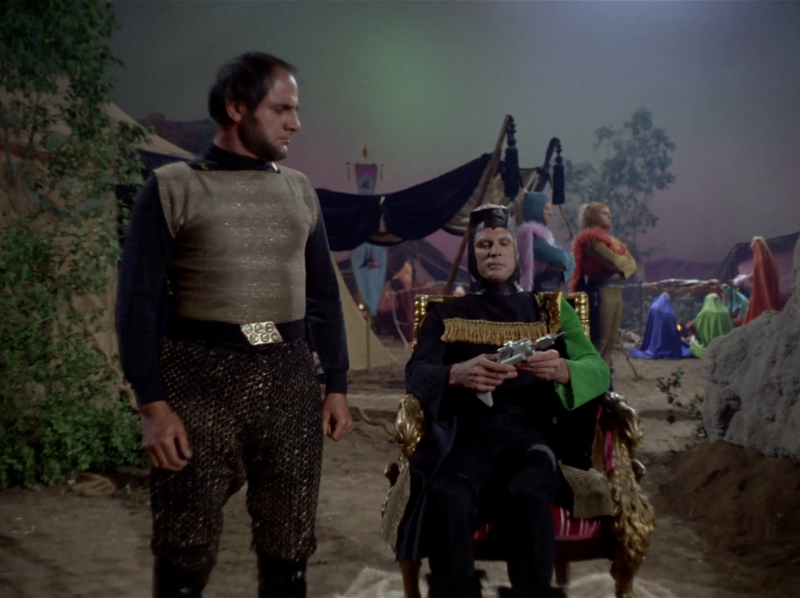 I always hate that TOS made the Klingons out to be such conniving sissies! As usual... Another follow up. I loved the interactions between McCoy and Eleen when slap each other! That S___ Eating grin on her face is priceless! I also always like when Kirk baits Spock with "Well, if you don't think it'll work, maybe we shouldn't try..."
Did anyone else notice the Klingon falling down as they were approaching? They even kept the follow-up scene where he is recovering from his fall! I'm consistently annoyed by their warp factor choices! The plague on New Makus when after Spock and the remains of the Galileo Seven get back on board, Kirk heads off at Warp 1! WTF?